This map shows the areas where visitors go most frequently in the Wine Country of Napa Valley and adjoining parts of Sonoma County. 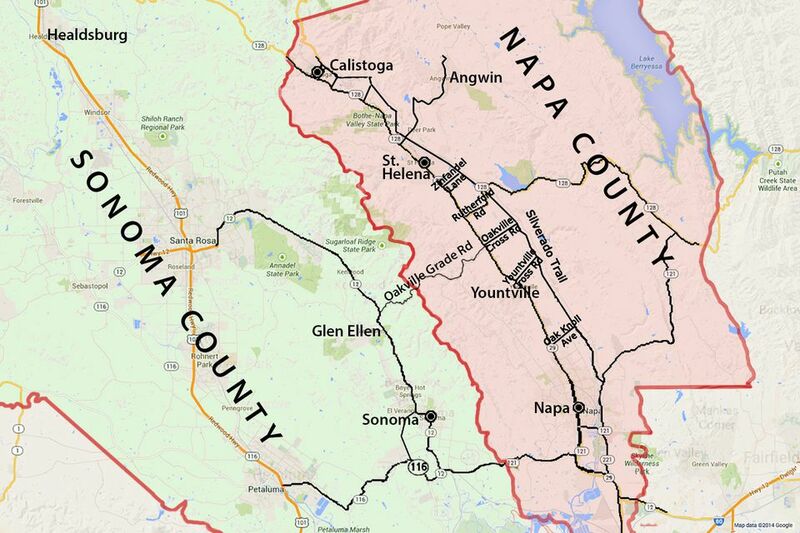 The roads shown on the map that ​connect Highway 29 and Silverado Trail in Napa Valley are the only major cross-routes. You may be wondering why only one road (Oakville Grade Road) crosses the Napa-Sonoma County line. It is one of the few that go over the mountains that define the western side of Napa Valley, Although it's the fastest of the direct routes, it's narrow and winding, making it faster to go around the mountains than across them. You first stop going north through Napa Valley is the Town of Napa. Once a sleepy little place that most people sped right through on their way north, it's becoming a destination worth considering, with fine dining, in-town tasting rooms, and a scenic riverfront. Yountville is Napa Valley's gourmet town, with no less than five restaurants owned by Chef Thomas Keller of the French Laundry. It's also home to some of the valley's most luxurious lodging and the JCB Tasting Salon. Owned by Jean-Charles Boisset (JCB), it features unique wine flights and a gourmet shop full of hard-to-find (and totally delicious) food items. Cute little St. Helena has a main street lined Victorian-style houses and turn of the century storefronts, filled with local boutiques, eateries, and food shops. At the north end of Napa Valley is Calistoga, a charming little place full of hot spring-fed spas, with a friendly, small-town feel. The two most famous wine towns in Sonoma County are shown on the map on the first page of this guide. The town of Sonoma dates back to California's early days as a Spanish colony and has an old Spanish mission right in the middle of town — which surrounds a tree-shaded park. From there, it's easy to travel north into Sonoma Valley for wine-tasting. Check out how to plan your Sonoma Valley getaway — and a few of the area's best wineries to try. At the north end of Sonoma County are the town Healdsburg and the Alexander Valley and Dry Creek wine regions. Like Sonoma, the downtown area faces a city park. Healdsburg is also full of high-end eateries and surrounded by award-winning wineries. You can use an online guide to plan a day trip or a weekend visit. The majority of visitors to Napa and Sonoma start their trip in San Francisco or the San Francisco Bay Area. If you're an area resident, you probably plan to drive to Wine Country. If you're from somewhere else or looking for a way to tour these wine regions without having to drive yourself, check out the ways to get from San Francisco to Napa Valley. If you're only planning to go for a day trip, check out a fun plan for spending a wonderful day in Napa. And you'll definitely want to know how to survive a day of wine tasting. Napa Valley is small enough that you can cover much of it in a weekend — although it would take you many times that long to visit every one of the hundreds of wineries in the area. Everyone has their own ideas about the best time of year to visit Wine Country and every season has its pluses and minuses. These seasonal guides will help you decide when is the best time for you: Napa in Winter, Napa in Spring, Napa in Summer, or Napa in Fall. Sonoma is a huge county and the Town of Sonoma, Sonoma Valley, and Healdsburg are only a few places you can go. You can also spend a weekend exploring Sonoma’s backroads or puttering around the Russian River. Or you can go to the edge of the continent and take California Highway One from San Francisco north through the Sonoma Coast.